A government contractor providing engineering, maintenance, IT, product procurement, and other services to defense and civilian government agencies was five months away from its Contractor Purchasing System Review by the Defense Contract Management Agency (DCMA). Unfortunately, the contractor did not have a federally compliant purchasing system which typically takes a year or more to install and gain governmental approval. Without a compliant purchasing system, the contractor risked exclusion from doing work for the government agencies it was set up to serve. 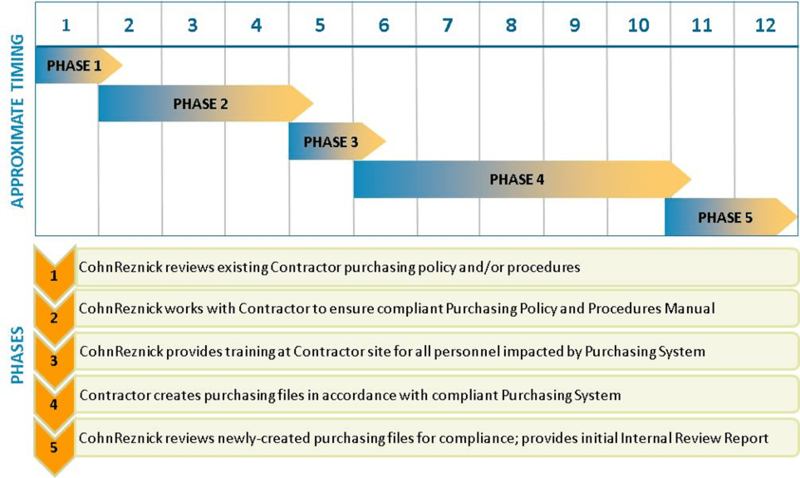 By using our CohnReznick compliant purchasing system tools such as our Policy and Procedures Manual template and related training materials, the client installed a fully compliant purchasing system in record time – setup in just over 4 months and governmental approval in less than 5 months after the DCMA’s review. The client was able to continue its support of government and civilian agencies without interruption. Whether you have signed a federal contract with the DFARS Clause No. 252.244-7001, Contractor Purchasing System Administration (or equivalent from another agency), or have the DCMA (or equivalent from another agency) lined up for a Purchasing System Review; we can help you implement a compliant purchasing system.